Cause Café hosted a homecoming ceremony for Michael "Mikey" Brannigan, a Northport resident who won the gold medal in the 1,500-meter run at the 2016 Paralympics in Rio de Janeiro, Brazil. This was covered by Newsday, Newsday.com and News 12 and The Long-Islander. Gershow Recycling was featured in The Smithtown Messenger for its donation of $2,000 to the Play for Peace Soccer Tournament. Brian Ridgway was named the new village administrator for the Village of Old Westbury. This was reported by Garden City News. Mayor Allan M. Dorman of the Village of Islandia was interviewed by Newsday for an article on buying a house in Islandia. Charles Rutenberg Realty of Long Island (CRRLI) owner Joe Moshé was quoted in a Newsday article about rising home prices in Nassau County. The New York Real Estate Journal covered the ribbon-cutting ceremony of Rutenberg's Bronx Office opening. ​Cause Café was featured on News12 Long Island. Newsday covered the Long Island Game Farm's 1970's Day and its new Giraffe Encounter. The daily newspaper also ran stories about the Game Farm's camel-naming contest and the birth of their second baby camel. BrickHouse Brewery was recently awarded for its popular craft beer in the Hometown Showdown, which was featured on News12 Long Island. ​Gershow Recycling's ninth annual Chuck Varese Vehicle Extrication Tournament was covered in American Recycler. La Tribuna Hispaña and The Long Island Advance reported Gershow's participation in the Play for Peace soccer tournament. Additionally, their donation of a vehicle to the Sayville Students Against Destructive Decisions (SADD) was covered in Recycling Today. Lobster Roll was featured in an article on Yelp on Long Island's best lobster rolls. Star Island Yacht Club & Marina made it into the Wall Street Journal in an article about not-so-hidden gems in the Hamptons. The Village of Islandia recently voted to approve Long Island's first casino in the village's Marriott Hotel. This was covered by Long Island Business News and News12. News12 reported on the opportunities Cause Cafe gives its disabled employees. Charles Rutenberg Realty (CRRLI) recently celebrated its 10th Anniversary, which was covered by The Bronx Times Reporter. CRRLI also recently opened a new location in the Bronx, which was covered by Real Estate Weekly and the New York Real Estate Journal. Charles Rutenberg Realty was featured in Newsday. Gershow Recycling was featured in a Newsday article for its "Christmas in June" event at Boomers Family Fun Center. Gershow's generous scholarships to certain graduating high school seniors were noted by Recycling Today, as was Gershow's involvement with the Sayville Students Against Destructive Decisions. Gershow was also featured by American Recycler for its donation of 30 vehicles to an annual extrication tournament held at Steer's Pit. The Sag Harbor Express featured Star Island Yacht Club's fishing tournament in an article about a prize 730-pound mako shark. BrickHouse Brewery was recently awarded for its popular craft beer in the Hometown Showdown, which was featured on News12. GreaterPatchogue.com and Hometown Shopper featured McPeak's Assisted Living in an article about the facility's newest centenarian. News 12 interviewed Dr. Andrea Jackman of Central Veterinary Associates for her opinion on the New York State Legislature’s proposal to prohibit the declawing of cats. Tom Archer of Archer Financial Group announced that he signed the largest life insurance policy for an individual. That was reported in Long Island Business News. Mr. Archer was interviewed for one article in LIBN on how high-net worth individuals use life insurance policies as a form of wealth management and another LIBN article on how baseball has become big business. Mr. Archer was also interviewed by Investment News for an article on cash-value life insurance. Dr. Yacov Shamash was featured in Networking’s Briefs section for being named Chairman of the Board of School-Business Partnerships of Long Island, Inc (SBPLI). SBPLI was featured in a Smithtown Messenger article about its Smithtown robotics team. Ben's Kosher Delicatessen Restaurant & Caterers hosted a political primary event. This was covered by FiOS1 and Newsday. BrickHouse Brewery recently celebrated its 20th Anniversary. This was covered by News 12, Patchogue-Medford News, and Long Island Advance. The Long Island Game Farm was recently featured in Newsday. The Game Farm's newest attractions were featured on News12 Long Island. The television show The Affair follows fictional owner of real-life Lobster Roll Restaurant, which was featured in Dan's Papers. Lobster Roll was also featured in edible Long Island for its new food truck. Dan's Papers mentioned Star Island Yacht Club's Shark Tournament and concurrent Shark Tournament Awards Ceremony in its East End events listing. Newsday featured LL Dent Restaurant's 10th Anniversary. LL Dent was also named one of the Ten Great Eats on the Way to Jones Beach by Explore Long Island. Our Coffee with a Cause held a grand opening for its new brick-and-mortar store, Cause Café, which was featured in The New York Times, Fox5NY, HLN TV, Newsday, Times of Huntington-Northport and News 12. OCC founder Stacey Wohl was also interviewed by LI News Radio for a local business spotlight. Charles Rutenberg Realty real estate agent Ari Leshans was interviewed by Homes.com for an article about buying non-traditional houses. The Syosset-Jericho Tribune interviewed Joe Moshé about the firm’s 10 years in business. School-Business Partnerships of Long Island won the Imagine Award for Innovation at the 2016 Imagine Awards Ceremony, which was covered by Long Island Business News. FiOS1covered this year's FIRST Robotics Competition (FRC) and Newsday published the results of the FRC Long Island Regional and profiled the tournament MVP, Nick Liuzzi. Central Veterinary Associates' Dr. John Charos spoke to QNS about the city's new spay-and-neuter law. An AAA Northeast article listed LL Dent Restaurant as one of best Long Island restaurants for brunch. Newsday interviewed James McPeak of McPeak's Assisted Living Facility about the benefits and challenges of operating an independent assisted living facility. Westchester Magazine recently ran a story regarding prepping for Seder dinner, which featured Ben's Kosher Delicatessen, Restaurant & Caterers' chicken soup recipe. Odyssey Online named The Long Island Game Farm as one of the "16 stops to make on Long Island during summer 2016". Lobster Roll Restaurant was mentioned in a Newsday article about famous Long Island pop culture references in music, movies, books and television. Long Island Business News interviewed Joe Sicinski of School-Business Partnerships of Long Island (SBPLI) on the organization’s FIRST® (For Inspiration and Recognition of Science and Technology) Robotics Competition and the challenges SBPLI faces as it hosts the competition each year. FiOS1, Newsday.com and The Suffolk Times also covered theFIRST Robotics Competition. The winners of School Business Partnerships of Long Island's FIRST LEGO League Championship tournament were announced in Newsday. Charles Rutenberg Realty (CRRLI) announced the firm is celebrating its 10th anniversary this year. This was reported by Real Estate Weekly and New York Real Estate Journal.CRRLI broker/owner Joe Moshé was quoted in Newsday in an article about the proposed new design for Huntington Station. Lillian Dent of LL Dent has been chosen to receive Long Island Business News' Diversity in Business Award. Our Coffee With a Cause (OCC) founder Stacey Wohl was featured in a Long Island Pulse article on local businesses that employ individuals with autism. Tony Mauro of Sanders Thaler Viola & Katz, LLP was featured in Long Island Business News' Ones to Watch in Accounting/Nonprofits. Business News Daily interviewed Ronnie Dragoon of Ben's Kosher Delicatessen Restaurant & Caterers on the impact of a growing population and tourism on small businesses in Florida. Paul Mertz, CEO of P&P Medicaid Consulting was quoted in a Newsday article about the benefits of pooled income trusts. LI Pulse Magazine featured photos from the Second Annual Phoenix Gala presented by North Shore Horse Rescue. This year's award recipients were the Novak family from Long Island Game Farm. Charles Rutenberg Realty Owner//broker Joe Moshé and Agent Jamie Gorman were interviewed by Newsday for an article on the decline in home prices compared to peak prices eight years ago. Robert Cabral spoke with Fox Business News about the myths and realities of mortgage rates. Commercial Agent Howell Silverman was appointed Vice President of LIBOR’s Long Island Commercial Network. This was reported in The Mann Newswire. School Business Partnerships of Long Island's FIRST® (For Inspiration and Recognition of Science and Technology) Robotics Competition (FRC) kick-off at Stony Brook University was covered by Newsday. The organization's FIRST LEGO League (FLL) qualifiers that took place at Mineola High School were reported by FiOS1. The FLL qualifiers held at Longwood High School were covered by Newsday's print edition and online. Newsday reported on North Shore Horse Rescue's upcoming gala, which will honor the owners of the Long Island Game Farm. Long Island Jewish World reported on the first birthday of Ben's Kosher Delicatessen Restaurant & Caterers' Scarsdale location, while Scarsdale Patch also featured an article about the restaurant’s meal deals. Ben's was given a nod by Dr. Harvey Passes, DDS, which was reported on by The Island Now and Long Island Jewish World. Our Coffee with a Cause was featured in Long Island Pulse. Central Veterinary Associates’ Dr. Greg Nelson was interviewed by Fios1 regarding best practices for keeping your pets safe in the winter months. Several PRMG clients were announced as winners of the 2016 Long Island Press Best of Long Island. Ben’s Kosher Delicatessen Restaurant & Caterers won Best Family Style Restaurant, Best Hot Dog, Best Pastrami Sandwich and Best Sandwich Deal; Star Island Yacht Club & Marina won Best Marina, Best Boat Store, and Best Fishing Supply. Ben's Kosher Delicatessen Restaurant & Caterers was featured in Business News Daily. Charles Rutenberg Realty President and CEO Joe Moshé was appointed a Board Member of the National Association of REALTORS®. 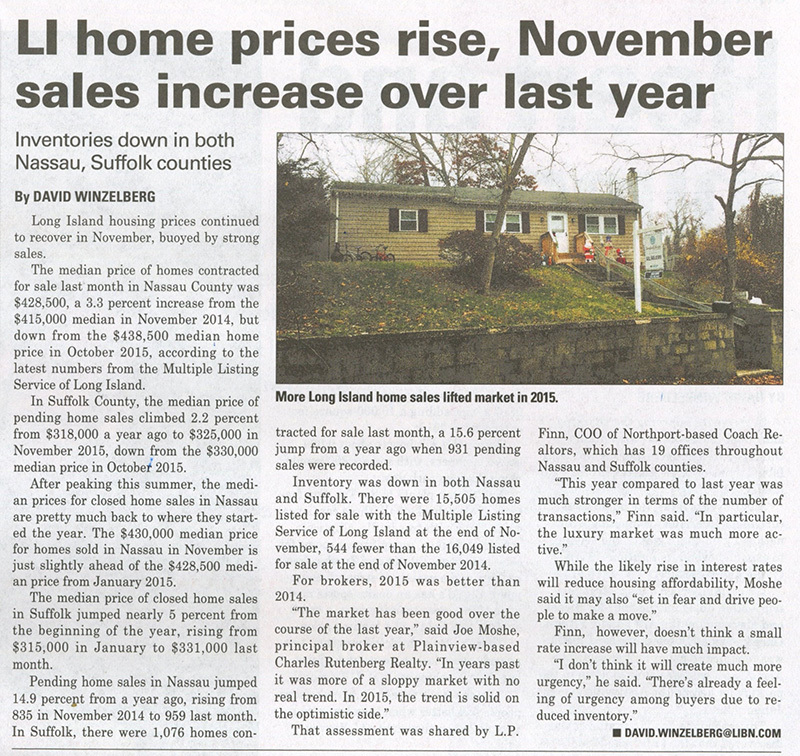 Long Island Business News quoted Mr. Moshé in an article comparing housing prices in 2015. Community Housing Innovations' (CHI's) new Fresh Start program was covered by Channel 2 Newsand GreaterPatchogue.com, Long Island Advance, Mid Hudson News, Hudson Valley Press and Newsday. CHI's Alexander Roberts appeared on TV 55’s Exit 10/55 to talk about the launch of the Fresh Start program to help homeless families on Long Island and Westchester County transition to permanent housing. Fios 1 News interviewed Central Veterinary Associates' (CVA's) President/CEO and principal veterinarian Dr. John Charos about holiday pet safety. Dr. Charos was named a King of Queens by The Queens Courier for his business leadership. The Queens Courier also ran CVA's holiday pet safety article and Long Island Herald ran the organization's article on holiday gifts for dogs. One of School-Business Partnerships of Long Island's coaches was named a "Person of the Year" in the Times Beacon Record. Chris Pinkenburg, head coach of the Rocky Point FLL team "Gear Headz" was awarded for inspiring students to pursue science and math through the robotics program. Sanders Thaler Viola & Katz, LLP's managing partner Scott Sanders was interviewed by Long Island Business News about the changes to this year’s tax code and the tax break extensions that Long Islanders can receive. Our Coffee with a Cause was featured on Channel 4 NBC New York, the Port Times Record and Coffee Talk's Daily Dose blog. The Journal News featured Ben's Kosher Delicatessen Restaurant & Caterers. Lauren Rothe of Brick House Brewery was interviewed by Restaurant Hospitality for an article on how restaurants should be decorated for the holiday season. PRMG assisted the Pace family in announcing the passing of attorney John Pace, who served as a board member and pro bono counsel for Breast Cancer Help, Inc. This was reported by Newsdayand The New York Law Journal.